Rogers Communications Inc., Canada's largest telecom company with assets that include cable, internet and broadcast TV assets such as Citytv and Sportsnet, has announced 375 more layoffs. "This was a very difficult decision," company spokeswoman Patricia Trott said in a statement. "This is part of a comprehensive approach to cost management that we announced earlier this year." Employees were notified on Monday. The cuts come on top of about 300 layoffs across its operations that the company announced at the end of March. The latest downsizing covers a variety of skills and includes some management and sales positions. "Going forward, we're managing costs where it makes sense but we're continuing to invest in driving the business forward and obviously we have a focus as well on driving revenue, new sources of revenue," Trott said. Rogers has been struggling with slowing growth in revenue from its mobile and wireline divisions. It hopes to get increased revenues from its mobile banking initiative, Internet-connected devices such as parking meters and other business services. Its stock price has lagged amid stiff competition from rivals Telus Corp. and BCE. After the cuts announcement, Rogers Class B shares closed with a gain of 33 cents, or 0.90 per cent, at $36.84 on the Toronto Stock Exchange Tuesday. RBC Capital Markets analyst Drew McReynolds said the cuts are indicative of competition and reflect's management's goal of maintaining its profit margins. "We continue to expect Rogers to 'grind away' in 2012 pending a more balanced competitive equilibrium on wireless and television (our estimates and consensus are below 2012 guidance)," McReynolds wrote in a research note. McReynolds said the discount that Rogers trades relative to its large-cap peers reflects these competitive headwinds. 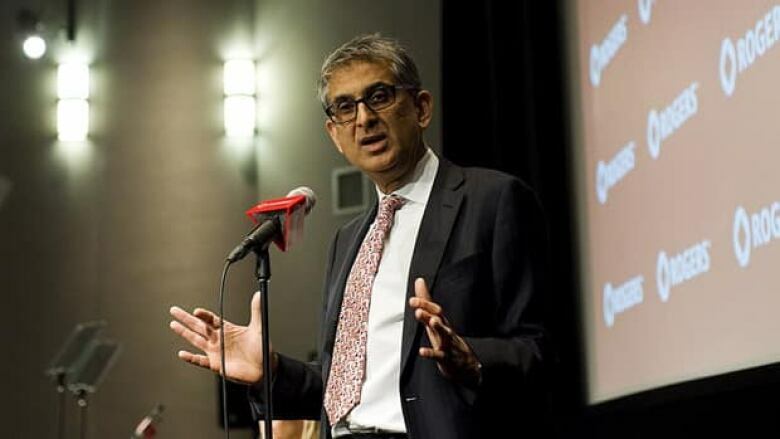 "In the short term, we're addressing the cost side of the equation," chief executive Nadir Mohamed said after Rogers's annual meeting in April. "There's clearly going to be pressure on the top line," he said then. Rogers also owns a slate of print magazines including Maclean's and Chatelaine. Late last year, Rogers and Bell Canada teamed up on a $1.07-billion bid for a majority stake in the country's biggest sports franchise company, Maple Leaf Sports & Entertainment.